India’s Viswanathan Anand had good chances in Game 11, but faltered in a complicated queenless middlegame. The Norwegian wunderkind, Magnus Carlsen, has defended his World Chess Championship title after defeating Viswanathan Anand of India in 11th game of their match in the Russian Black Sea resort of Sochi. Sunday’s win gave Carlsen, 23, an unassailable lead in the match of 6 1/2 to 4 1/2, rendering the planned 12th and final game unnecessary. The Norwegian has beaten Anand, 44, for the chess crown for the second year in a row, with his first success coming in Chennai, India in November 2013, by the score of 6 1/2 to 3 1/2. 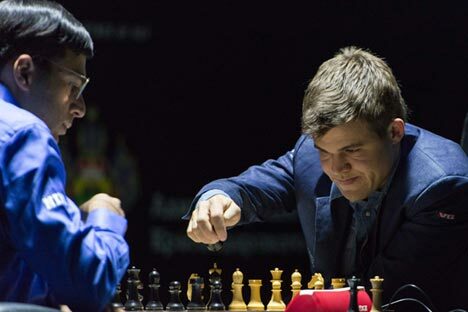 Carlsen and Anand agreed to a draw in game 10 of the match in Sochi on Friday before going into Sunday’s battle. Leading Anand 5 1/2 points to 4 1/2, Carlsen knew he had to make Sunday’s game count, or face a nerve-wracking final game with the black pieces. “Perhaps, I didn’t play the best, say from Move 18 to 23,” Carlsen said. “All of a sudden, this move (Anand’s 26th), created a lot of counter-play. I am very happy with the way I pulled myself together. After he gave up the exchange (rook for bishop), I played quite forcefully. He didn’t have many chances,” said Carlsen. Anand beat seven of the world’s top grandmasters in the Candidates Tournament in Khanty-Mansiysk, Russia in March, to qualify for the World Championship match in Sochi. When asked by a reporter if he was going to retire from the game, Anand said no. The Chess World Championship is the third major sporting event that took place in Sochi this year as the city successfully hosted the Winter Olympics in February and Russia’s maiden Formula 1 Grand Prix in October.